Wellington, 11 October 2014 – CBRE is pleased to announce a rare opportunity in Petone, with the sale of 476-486 Jackson Street, located on the foreshore of Petone, Lower Hutt. Selling on behalf of Unilever NZ Trading Limited (Unilever), the property is being marketed by John McKenzie and Brent Ringrose and is available for sale by Deadline Private Treaty, closing at 4pm Tuesday 4 November 2014. The property occupies a strategic site of approximately 5.0 hectares with a net lettable area of over 31,300sqm. With the added advantage of existing consent to extract over 900,000m3 of water from the Waiwhetu Artesian Aquifer, this is an excellent opportunity with endless potential for astute developers. Current net income from the site is $293,077 per annum derived from the current tenant; Orora Cartons NZ. Unilever has announced its plan to relocate production of its laundry powders to Australia and close its Petone manufacturing site at the end of 2015. The company has had a long association with Petone and manufacturing operations began on the current site in 1919 with Sunlight Soap. 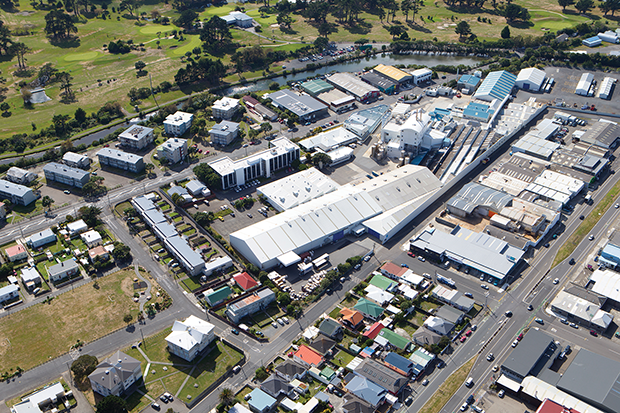 More recently, the Petone site has produced all Unilever’s laundry powder for both Australia and the domestic market. As part of the decommissioning process, Unilever has worked closely with Hutt City Council on the future of the site and the Council has shown a willingness to engage on future proposals for this significant land holding. Ringrose adds that in addition to its appeal, Petone continues to emerge and develop into one of Wellington’s preferred boutique retail, residential, café and restaurant locations. “The suburb benefits directly from its central location, ease of accessibility, and close proximity to the waterfront. This combined with the Petone character architecture have become an irresistible draw card to both residential and commercial occupiers, investors and developers equally. McKenzie says, “The site has three street frontages, Jackson, Waione and East Street. The possibility to own and develop one of Wellington’s largest development opportunities is second to none, CBRE is expecting high interest in 476-486 Jackson Street, Petone.